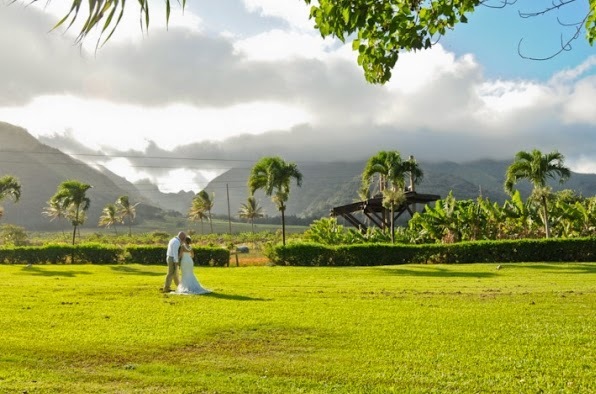 Robert & Kari arrived at the Kahului Airport (OGG) on October 9th and checked into the Pohailana Resort in Kahana. 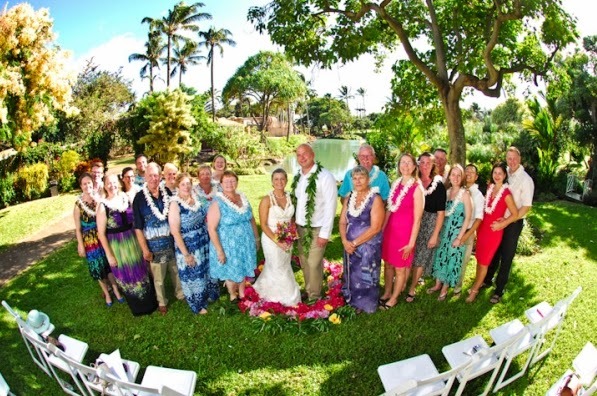 Robert & Kari brought with them 18 guests to witness them tying the knot at the Maui Tropical Plantation. Kari selected one of the best stylists, Jackie Cavallo, to come to her room for her hair & make-up, she looked gorgeous! Since they had so many guests they required 20 chairs provided by Aimee Singer's rental company, and also wanted a circle of love flower circle to stand in during their ceremony, arranged by florist expert Andrea Padilla. Although they did not designate a best man & maid of honor, they had plenty of help from all their family members and friends. 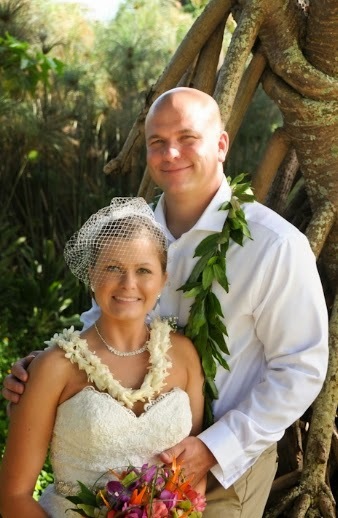 To show them all aloha, Rob & Kari also ordered white orchid leis for all of their guests. 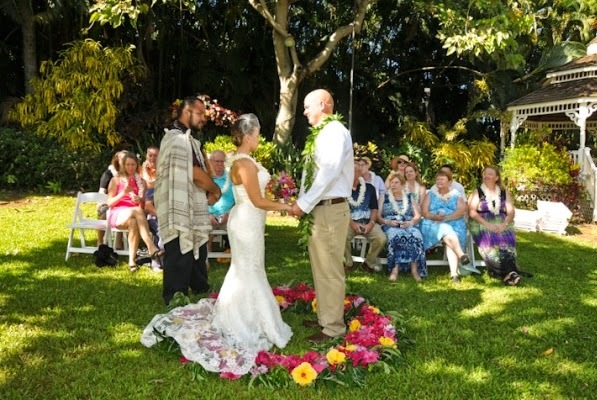 Rob presented leis to the guests as Kari presented them to her father, sister & best friend. They selected Rev. Kamuela Rodrigues to perform their Hawaiian style non-religious ceremony, and key photographer Tim Clark to photograph their ceremony and family photos. It was a great opportunity to get great photos with family, many of whom they haven't seen in years. Tim was assisted by Elizabeth Clark, his daughter, who also photographed a "B" roll. Music was provided by Tim O'Hara who sang "Pua hone" and Israel Kamakawiwo'ole's version of "Somewhere Over The Rainbow", among other appropriate melodies. 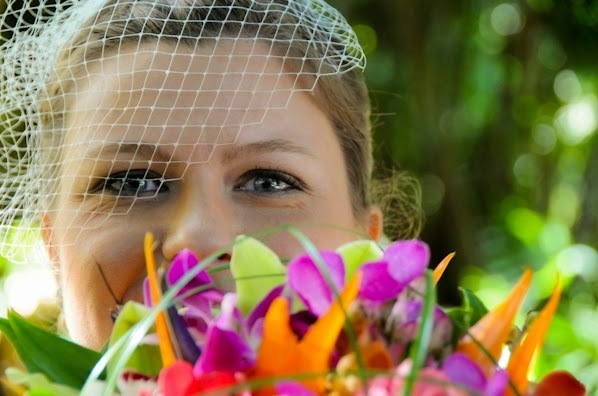 After their ceremony, the couple and guests whet out to dinner at a nice restaurant in the Kahana/ Ka'anapali area.